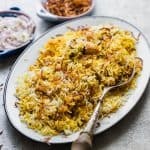 This chicken biryani recipe has been one of the most requested reader recipes and I’m so excited to share it with you today. Succulent, juicy pieces of chicken are cooked in a yogurt marinade and then layered with crispy onions, coriander, mint and basmati rice to give you a dish that the entire family will enjoy. I’ve broken the process step by step and made a recipe video for this chicken biryani so that you can make this restaurant style biryani at home! I have to be a 100% honest with you. I had never made chicken biryani before I decided to share this recipe. And I got convinced because so so many of you have requested for a legit/authentic biryani recipe. And we are biryani lovers. Mostly mutton though but this chicken biryani really changed our mind. The first time I attempted it, I was nervous, because it seemed so difficult and daunting and it looked like there were a gazillion steps. So I took a deep breath and decided to break them down for you. This Hyderabadi Chicken Biryani gets a lot of its flavour from the marinade. We are using yogurt as a tenderiser, and fried onions (birista), tomato puree, chilli powder, turmeric powder, coriander powder, garam masala and salt to flavour the chicken. It’s important to marinate the chicken for at least two hours or overnight for the maximum flavour. I prefer using only chicken thighs and legs for chicken biryani because these are the juiciest and do not become dry while the biryani cooks. Fried onions are a key ingredient here, and its important to get this right. Onions are cut into slices and then browned on medium flame in oil. They don’t need to be extra crispy, but onions should be a deep golden brown without getting burnt. You can also use store bought fried onions which are easily available in supermarkets these days. While choosing rice for the biryani, make sure to buy ‘basmati rice’ and not long grain rice. While they may look similar at first, good quality basmati rice is fragrant, and has grains that are thin and long as opposed to long grain rice which has fatter grains and almost no fragrance. 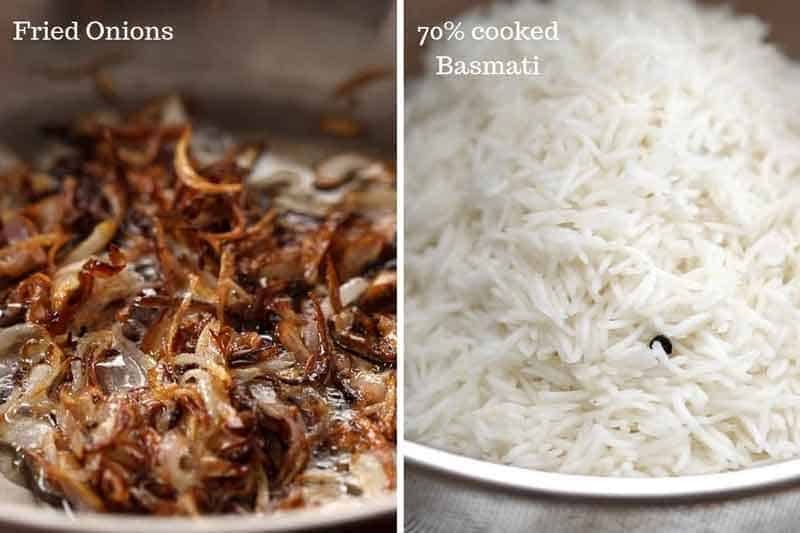 The basmati rice is cooked for exactly 5 minutes in boiling water with whole spices and salt to get it to the right doneness – which is 70%. The rice continues to steam when we finally cook it along with the chicken. Once you have your chicken marinated, rice and fried onions ready, start by cooking the marinated chicken. 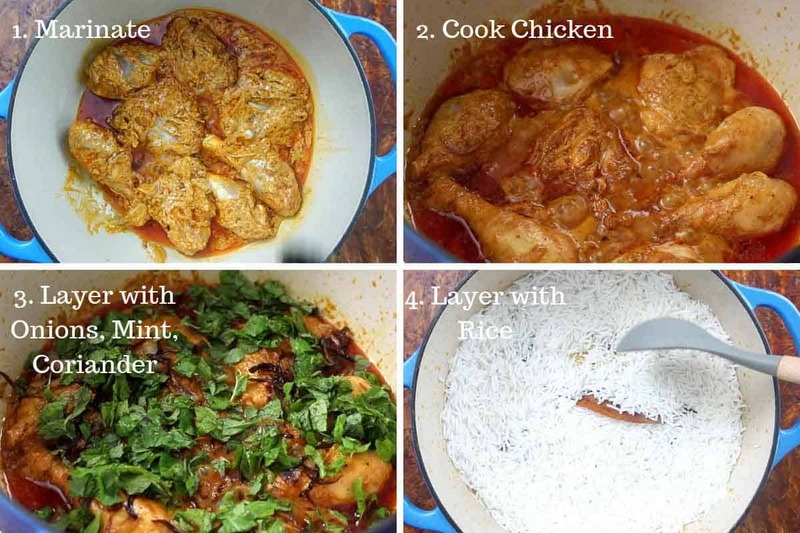 Once the chicken is partially cooked, it’s important to layer it with the fried onions, mint and coriander. The onions add sweetness and richness while the herbs add a ton of flavour. This is then layered with rice and then topped finally with soaked saffron and ghee. And there you go! 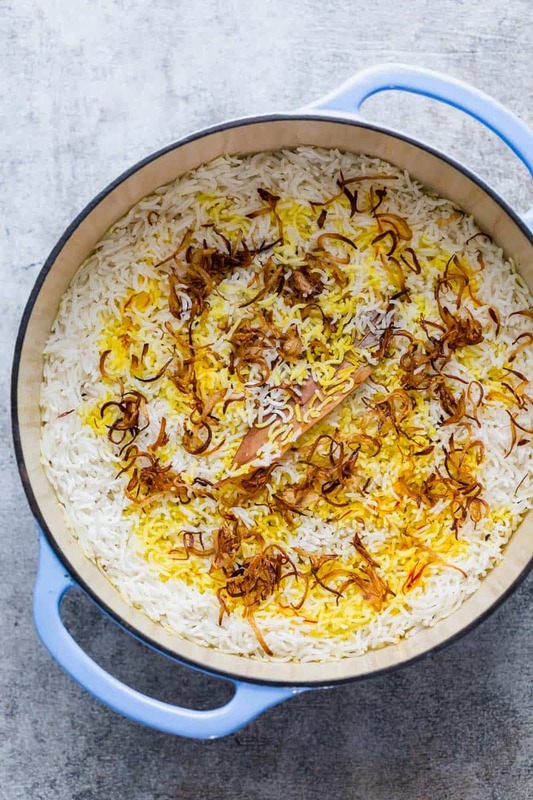 The whole thing takes approximately an hour so I call this a weekend project, but after you’ve done it once, you’ll realise how easy and simple making biryani at home is! The results of your labour will look like this, and trust me, there is nothing like the smell of chicken biryani wafting through the house to get everyone to the table! Let’s just say – five attempts to make sure I provide you with instructions that you can actually follow with ease at home did not seem like work. Also pro tip: its really important to use a heavy bottomed pot when you make chicken biryani, or the chicken pieces can be scorched or burnt. A dutch oven will be your best friend while making this biryani because it heats evenly and stays warm. It also has a thick bottom that does not let your food get burnt easily. Watch Recipe Video ABOVE for step by step directions. This homemade chicken biryani recipe is easier than you think. I have broken down the entire recipe into a step by step process so that you can make this at your own pace. 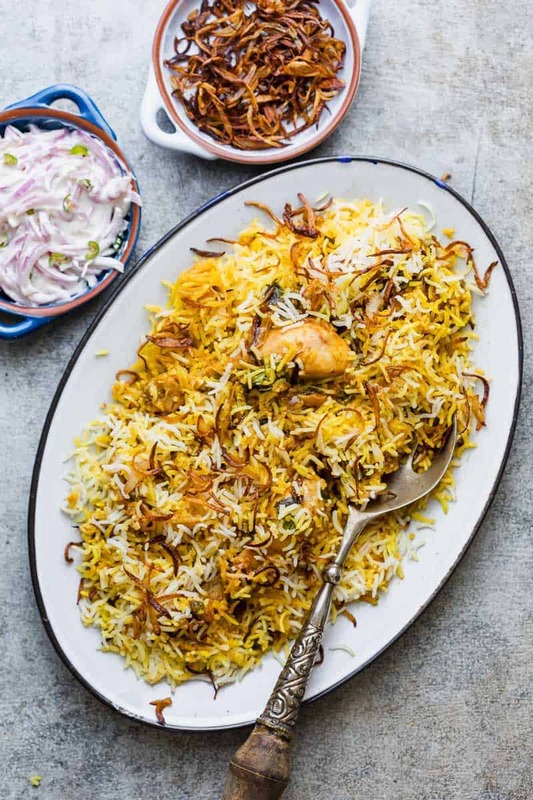 This biryani recipe is closest to Hyderabadi Biryani where chicken and rice are layered to make the most fragrant, and well spiced biryani. Brown Onions: To make the brown onions, pat the onions dry and if time permits, leave them out on a kitchen towel for 15-20 minutes to dry them out slightly. Heat oil in a pan and add the onions. On a medium flame, shallow fry the onions for 15 minutes till they are a deep golden brown, without burning them. Drain them out on a paper towel, and set aside. These can be made ahead and stored in an air tight container overnight. Burnt onions will add a bitter flavour to the biryani. You can also use store bought fried onions/ shallots which are easily available in leading supermarkets, Indian and Asian stores. Marinate Chicken: Mix together all the ingredients under chicken marinade and marinate for at least two hours or overnight for best results. Saffron: When you are ready to make the biryani, soak saffron strands in hot milk and rub them slightly with the back of a spoon. Set this aside. Parboiled Rice: Bring water to a roaring boil and add salt, whole spices and basmati rice. Cook for exactly 5 minutes and drain completely, leaving the whole spices in the rice. This will cook the rice to about 70% doneness which can be checked by pressing a grain of rice between two fingers – the rice should still be raw in the middle. To Finish: Once the biryani is cooked, let it rest for 5 minutes, and finish by scattering the remaining onions on top. Serve hot with your favourite raita. While a lot of restaurants use an entire chicken cut into medium sized pieces to make biryani, this is done to cut costs. Pieces like chicken breasts dry out during the long cooking process, and that’s why I recommend using only chicken thighs and drumsticks while cooking biryani at home. You can ask your butcher to cut each chicken leg into two parts to divide it into thighs and drumsticks. Leaving the bone in keeps the chicken juicy. Brown Onions can be slightly time consuming and tricky to make, and you can substitute them here with store bought fried onions. Just make sure that the onions are not batter fried. If you are in India, you can buy them online here, and if you live outside India, you can buy them here. They are also available at leading supermarkets, Asian and Indian stores. While buying basmati rice, make sure you buy rice that’s labelled basmati and not just long grain rice. Basmati Rice is fragrant and has slightly thinner grains than long grain rice. Real basmati rice is what gives biryani its distinct flavour and taste. In the last step of layering and cooking the biryani, all the ingredients are par cooked. Cooking the biryani on a low flame for 20 minutes, steams and cooks everything to doneness. If you don’t have a heavy bottomed pot, and are using a regular pot, you can place it on a tava (or flat griddle) and then place it on the stove on a medium flame to avoid burning the chicken. The tava or griddle creates a degree of separation between the flame and the pot and provides the perfect heat source. « Mediterranean Quinoa Salad – Fresh and Healthy! Thank you for such detailed instructions! I look forward to making your receipe. I love chicken biryani. I had a question, during the last stage, finishing it to cook for 20 minutes. if you are using a dutch oven or a similiar heavy duty oven proof type of cooking vessel, am I able to cook it in the oven to finish? Hey Bernadette, I wouldn’t recommend taking it to the oven. The temperature is going to vary in the oven from the stovetop, and the rice may not finish cooking in 20 minutes. I use a dutch oven to make my biryani because it has a heavy bottom and just finish it on the stove. Thanks for this !will try it out for sure ..
I’m glad that I found this blog. As I do not know how to cook but this is really helpful to give it a try. I will try it on my own. It was awesome. Thank you for the wonderful recipe. So glad you liked it Taina! Hi Richa, I tried your chicken biryani recipe and it tasted amazing. Loved it! Loved it! Thank you so so much Sarada! Really glad you liked it. I many times indulge in making Chicken Biryani at home, during special times and family times. You need a long list of spices to make the premium Chicken Biryani, but some highly important ingredients are cinnamon, clove, mace, dried mint, cardamom, nutmeg, and the nuts and dried fruits all combine to the taste and fragrance of the premium Chicken Biryani. Great recipe kids and hubby loved it. Thanks for sharing your feedback Sabina! Very good. My husband who is very sparing wigh his compliments said it was very good. Thank you. You are very talented. Thank you so much Tai. So glad you and your husband enjoyed this chicken biryani! Thanks for leaving your feedback Laveena! Your recipe was awesome.the fact that you divided the whole process into simple steps made it seem quite easy. The biryani turned out great… thanks for sharing this recipe. Glad you liked it so much Laya! Thank you so much. I’m glad the step by step process was helpful. Looks like a great addition to our weekly dinner rotation!